Premium quality glass award featuring a clear glass cylinder with a diagonal plane cut from top back to front, allowing a large flat space for engraving. 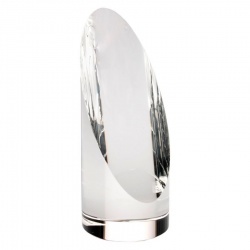 Standing 6.5in tall, these elegant awards are supplied presentation boxed. They are offered with low, fixed-cost text engraving and free logo engraving. Cylinder with diagonal engraving plane. Supplied boxed. 5.5in tall. Cylinder with diagonal engraving plane. Supplied boxed. 7.5in tall.